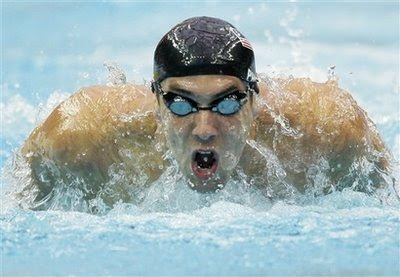 Home » michael phelps , olympics , sports » MOST GOLD EVER: Phelps wins 200 meter butterfly for 4th medal at Beijing Games! MOST GOLD EVER: Phelps wins 200 meter butterfly for 4th medal at Beijing Games! Butterfly is perhaps the most strenuous stroke of competitive swimming. And Michael Phelps won the 200 meter butterfly with a time of 1:52:03 early Wednesday morning at the Beijing Olympics. Phelps is now the most-winning Olympic athlete in history: ten gold medals so far in his career, with four in Beijing alone. And he's got a chance to bring home four more. Correction. 5 GOLD MEDALS!!!!!!!!! 11 all told!!!! YAY Michael!!!! YAY USA!!! He won ANOTHER one?! Holy cow!!! Yep. Another relay. Shattered yet another world record in the process.